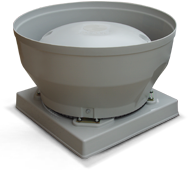 The Gamma EC Series of centrifugal roof mounted exhaust fans incorporates the latest state of the art, energy saving EC motor technology. They feature integrated infinitely variable speed control and eliminate the need for external VSDs, current overloads and motor phase protection. The Gamma EC Series is a simple "plug and play" system which means installers do not need to have specialised control programing knowledge. Matching sensors can easily be connected to monitor the ambient conditions in a space and provide real time feedback to the fan. The fan's on-board microprocessor can adjust the speed and therefore modulate the ventilation rate to match the specific requirements of the area. Models come in downflow or vertical discharge configurations and are available in 250, 315, 355, 450, 560 and 630mm fan sizes. Exhausts air from a wide range of commercial applications such as factories, warehouses and workshops, change rooms, bulk goods, retail outlets and assembly halls. EC motor features reverse polarity protection, locked rotor protection and soft start. No additional protection such as contactors are required. All models supplied standard with 0-10V control input. Diameter sizes 315mm and above can be pre-configured to suit specific sensors and specific applications. Designed for vertical exhaust applications.